Parking at UB North is free. Click below for the map of where to park on UB’s North Campus. Free parking is available in the 589 Ellicott St. Lot on the Buffalo Niagara Medical Campus (the lot across from the Trico Building & Innovation Center). PLEASE NOTE: Carlton, Elm and Oak streets will be closed to car traffic. The hospital parking ramp is reserved for patients. DO NOT drop off or unload at the main hospital entrance or parking ramp. Bus shuttles are scheduled from UB to Roswell Park every 30 minutes from 10:30 a.m. until 4:30 p.m. They will transport riders from the Lee Loop to the 589 Ellicott St. Lot. Each bus can transport up to 3 bikes per trip. Golf cart taxi services will be available on Friday (9 a.m. – 9 p.m.) and Saturday (5:30 a.m. – 3 p.m.). Look for yellow and black checkered flags throughout campus — these are pick up locations. Wait at a pick up location and a taxi will be by soon! The event layout at UB’s North Campus is new this year. To see your route map, click below to visit our Route Details page and find your route. Printed maps will also be available at check in and packet pick up. You can also download your route map to your phone, get turn-by-turn voice cues or download the GPX file by taking advantage of a free Ride With GPS account. Click here for more info. Need a bike for Ride Day? Our local bike shop partners have you covered! Click here to learn more. There will be several bike racks around UB North and Roswell Park. 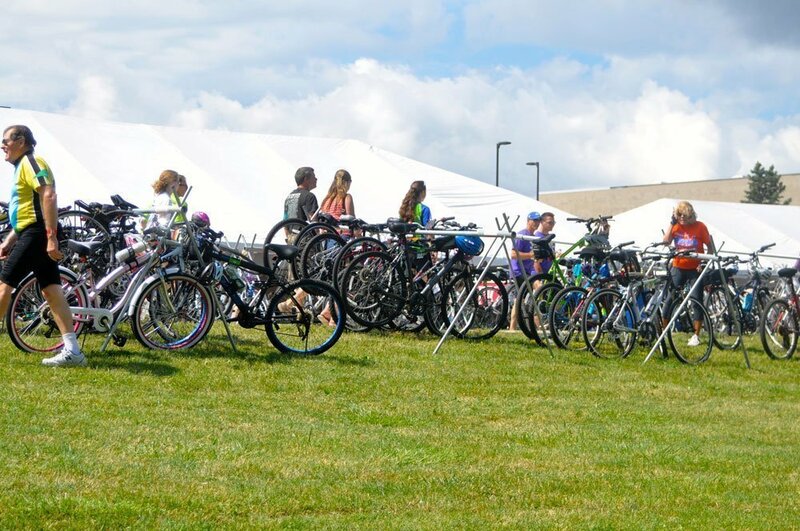 Park your bike at your own risk — The Ride For Roswell is not responsible for any lost or stolen items. Bike racks are proudly sponsored by Ferguson Electric.